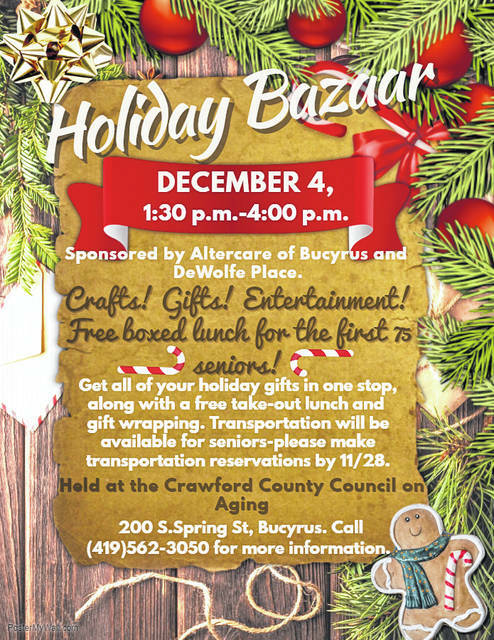 BUCYRUS — The Crawford County Council on Aging’s Holiday Bazaar is Dec. 4, from 1:30-4 p.m. at the Council on Aging office. The Council on Aging also is taking orders for its fundraising cookbook :From Our Home to Yours,” which contains recipes from the seniors, staff, and others of Crawford County. It would make a great Christmas present. It is $9, and all proceeds will go to benefit the Activities Department of the Crawford County Council on Aging, which is ran solely on fundraisers and donations.